Wondering where to head for your next holiday? 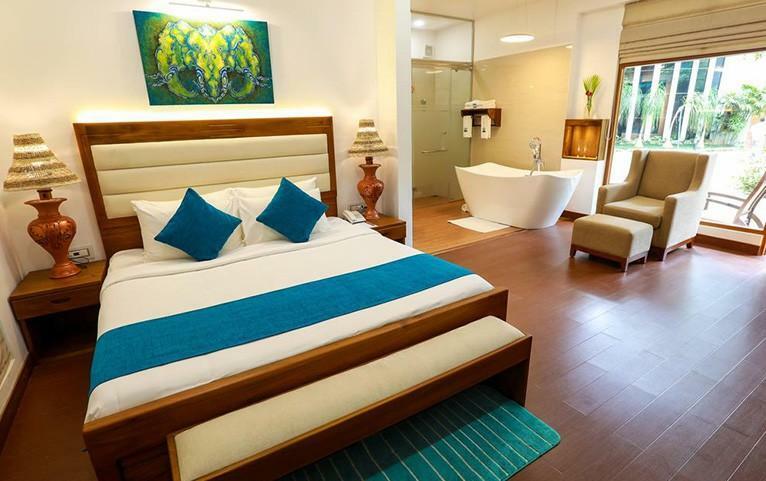 Airavata Luxury Boutique Resort has got you covered for all seasons. Stunning landscapes, infectious quietude and contemporary comfort - Airavata promises to be pristine by the day and alluring by the night. Nestled away from the hustle and bustle of the city of Kandy, the resort serves as an extension to your home with a touch of luxury. Whether you plan to sweat it out in the garden or spend your evenings by the pool, this exclusive abode brings to you an array of superior arrangements during your stay. Turns out, Airavata is a perfect amalgamation of luxury and comfort after all. 2 Nights Deluxe Room- 20 sq.m. 2 Nights Deluxe Suite - 30 sq.m. 2 Nights Premium Suite - 46 sq.m. 3 Nights Deluxe Room - 20 sq.m. 3 Nights Deluxe Suite - 30 sq.m. 3 Nights Premium Suite - 46 sq.m. Be prepared to let Airavata spoil you for choice with its surreal views, sumptuous spreads and enjoyable spaces. With its location around the city of Kandy in Sri Lanka, you also get to explore some sacred sites, biodiversity and the scenic Kandy lake in all its beauty. Located at an ideal distance of 15 minutes from the main city, Airavata lets you unwind and experience bliss at its best. Kandy offers a host of cultural attractions and amazing views to its visitors. You can choose to take a stroll along the tea plantations, revel in the picturesque serenity, or just contemplate about life with your eyes at the river. Kandy adds to your travel memories and lets you take some rich souvenirs back home. 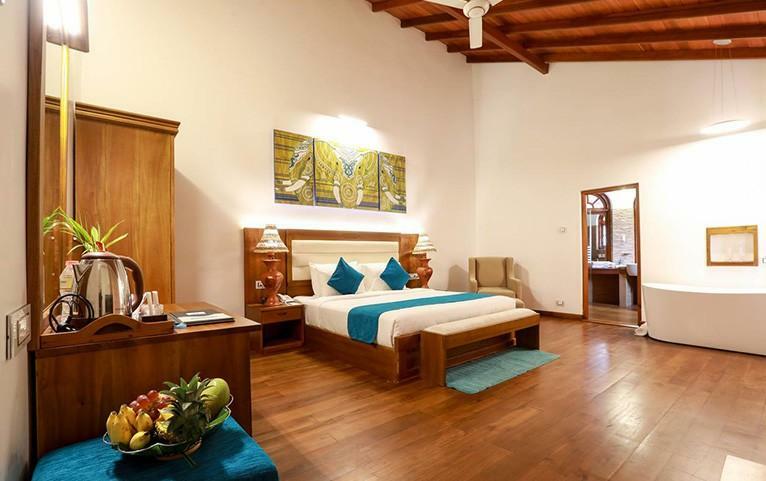 Airavata Luxury Boutique Resort spans across 11 rooms that sit atop a single floor. 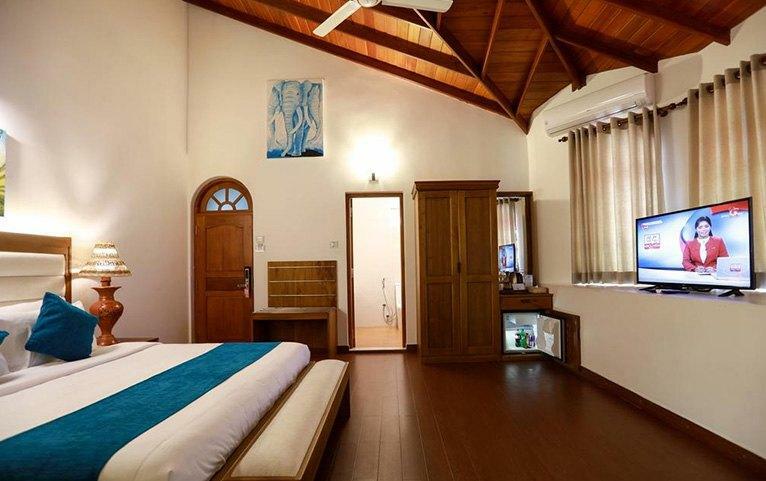 Its spacious, naturally-lit rooms make for a perfect ambience during your stay. Thoughtfully born of both comfort and style, the resort lets you have it all - indulge in the wellness routine at the spa bath tub, watch your kids enjoy a game in the playground or treat your taste buds to some culinary delights. Deluxe Room- 20 sq.m: Feel at home with a king-sized bedding, daily housekeeping, round-the-clock room service and a host of other facilities. Along with the tastefully done up decor of your space, you also get to enjoy the charm and serenity that is characteristic of Airavata. Deluxe Suite - 30 sq.m: Built to the highest standard of comfort and magnificence, the Deluxe Suite conveys a sense of timeless elegance. The beauty of its location as it stands overlooking the garden further adds to the charm of the place. Premium Suite - 46 sq.m: Spend your time amid state-of-the-art interiors, along with the privacy of a balcony that brings the outdoor beauty into your daily life. Whether it is unwinding or exploring your inner self, the suite ensures you make the most of your grand stay at Airavata. Extra Guest Policy: An extra adult can stay at a surcharge of USD 30 per night, with an extra bed and the inclusions available in the package, payable directly at the resort. Child Policy: One child (aged between 0-5 years) may stay free of charge, using existing bedding. A child (aged between 6-12 years) may stay at a surcharge of USD 20 per night, which includes an extra bed and package inclusions, payable directly to the resort. Laundry and Dry-cleaning Service: Avail laundry and dry-cleaning services that save you the hassle of handling your daily necessities. Airport Transfers: To ensure you are well looked after, the resort provides for a one-way airport transfer. Should you book a Deluxe Suite or a Premium Suite for 3 nights or more, the airport pick-up is included in your FABgetaways package. Room service: Choose to ask for assistance at any time during the day to help you make your life easier. Luggage storage: Shun all worries of carrying that extra baggage, thanks to the spacious storage area provided for your luggage. Restaurant: Relish all that it takes to have a happy stay – as you binge on with your favorite people and extensive dining options. Kids Pool: Let your kids explore a range of recreational options for their ideal fun-time in the Kids Pool. Bar/Lounge: Witness your stress levels go down at the Bar/Lounge after hours of rushing through the city buzz. Free Parking: Grab the most suitable parking space for free at the accommodation. Free High-Speed Internet: Stay connected while on-the-go with the Free WiFi facility at your disposal. Bandaranaike International Airport is the nearest airport from Airavata and is approximately 109.4 km away from the property. Most major cities in India either have direct or one-stop flights to Colombo. Upon arrival in Colombo, the resort can arrange airport transfers at a surcharge. Should you book a Deluxe Suite or a Premium Suite for 3 nights or more, the airport pick-up is included in your FABgetaways package. Alternatively, you can also take a scenic train ride from the Colombo Railway Station to reach the Kandy Railway Station from where you can hail a taxi to reach the resort.